BICC Publications/Compensation Matters. Securing community interests in large-scale investments. You are here: Home » Publications » Compensation Matters. Securing community interests in large-scale investments. Compensation Matters. Securing community interests in large-scale investments. 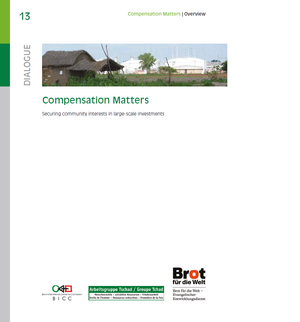 The study “Compensation Matters Securing community interests in large-scale investments” provides analyses of contentious issues in compensation matters such as power relations in negotiations, entitlements for compensation and types of compensation. Furthermore, it offers practitioners tools and ideas for how to approach compensation strategically, aiming for sustainable, just, and inclusive outcomes for affected communities.